A Puppy Was Dying and Needed Help . 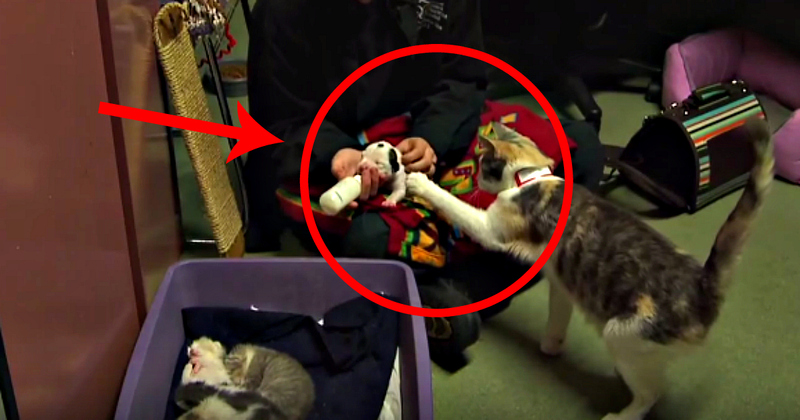 But What this Cat Did Left Everyone SPEECHLESS! There is nothing as powerful, as magical, as strong, as mother’s love. This incredible story took place in Cleveland.The Cleveland Animal protective League rescued a one-day-old abandoned Pit Bull puppy. He was found all covered with flies, fighting to survive. For Noland, that’s what they called him, getting nutrition and all the warmth he could get was vital. When he arrived to the shelter, he found a very unlikely volunteer that helped keep Noland alive. Please, SHARE this beautiful story with your friends. Lurlene treated all of her kids equally. Noland, a little Pit Bull who grew up among three kittens, even learned how to use the litter box! How awesome is that? When he grew bigger, Noland was put in a foster home with other puppies his age. From them he learned how to be a dog. Lurlene’s nourishment helped the puppy grow up strong and healthy. By the time Noland found a loving family who adopted him, his weight was 18 pounds, which is great for a puppy his size. His touching story helped the nonprofit organization Animal Protective League win a $25,000 grant from the Petco Foundation. Some people believe that cats have no emotions and cannot experience love or attachment. It turns out they do. Scientists came up to the conclusion that a cat’s gray matter shares some similarities to a human brain. Cat owners will tell you that their kitty has a wide range of emotions from happiness to depression. But, observing a cat’s behavior, we see it through the prism of our emotions, so we give the cat more credit. Despite the experts’ disagreement on the depth and range of felines’ emotions, there are known cases when cats traveled thousands of miles to find their owner, or became depressed and stopped eating after the loss of her kittens or her human family member.